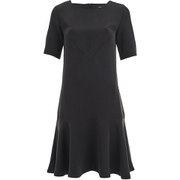 Women's off the shoulder dress from Selected Femme. Cut from premium, slightly shiny fabric with a slim fit, the 'Mathilde' bodycon dress showcases a bardot neckline with folded detail, and a pair of long sleeves for an elegant finish. Knee length. 52% Viscose, 48% Nylon. Model is 175cm/5'9 and wears a size S.
Women’s knitted ‘Mirja’ midi skirt from Selected Femme. Crafted from a lightweight knit blend, the pencil skirt sits high on the waist and forms a sleek silhouette with a bodycon fit. Cut to just below the knee. 55% Viscose, 45% Nylon Model is 175cm/5'9 and wears a size S/UK 8. 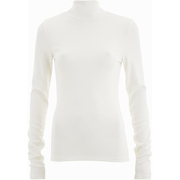 Women’s knitted ‘Mirja’ top from Selected Femme. Crafted from a lightweight knit blend, the sleeveless vest top comprises a boat neckline and forms a sleek silhouette with a bodycon fit. Complete with subtle stitch detailing to the sides. 55% Viscose, 45% Nylon Model is 175cm/5'9 and wears a size S/UK 8.